My friend Jordan sent me an amazing idea from Pinterest on how to organize supplies for wedding centerpieces. I thought it was brilliant, so I tried to pin it. "You've already pinned this," Pinterest said. This week's Pin of the Week is fantastic. It's pretty self-explanatory. 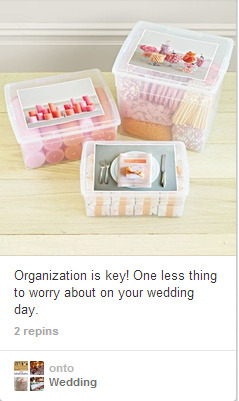 Create your table setting, snap a photo, put all necessary supplies in a box, and affix it to the box. Clearly, you won't be at your venue the morning of your wedding to set up the centerpieces, favors, welcome table, etc. You have other things to do (hair, make up, photos, etc.). This way, you can assign the decorating to someone (either a relative, your wedding planner, or someone at the venue) and know that everything is being set up exactly as the vision you have in your mind. And then you have one less thing to worry about. You know when you walk into your venue, your centerpieces and table settings and favors will be exactly the way you want and you won't have a mini breakdown because you wanted the favors in the center of each plate and instead they are where the wine glass was meant to be placed. Because yes, when you spend months planning a wedding, placement of a wine glass really does matter. BRIDAL BABBLE: Have you seen anything worth pinning lately? I would love to get my life more organized! This is a fabulous idea for any party, any time. This would make storage and set up tremendously easy for anyone who wants to help. Great idea. Makes it easy to delegate.